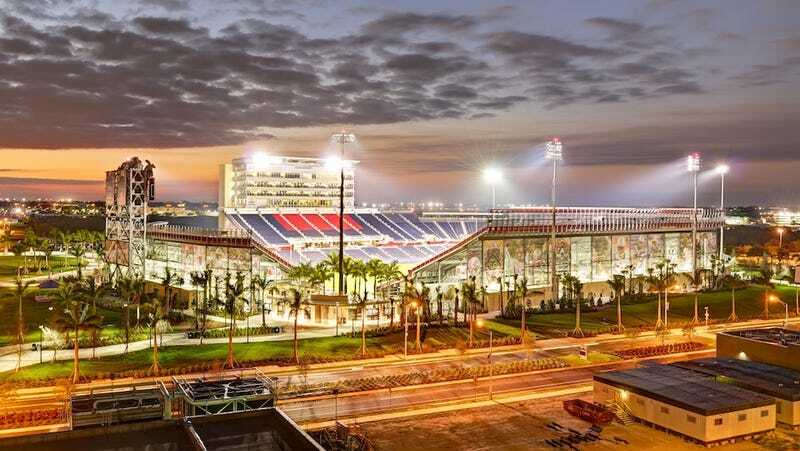 Florida Atlantic has been playing in its new on-campus stadium for two years, but has had a devil of a time selling the naming rights. No more, as the Owls plan to announce later today they've finalized a deal with The Geo Group, one of the world's largest operators of detention centers and for-profit prisons. Maybe you could have guessed this from the logo, which features the entire world imprisoned in the "O," but the Geo Group runs facilities in the US, the UK, Australia, and South Africa. Its revenue has gone up every year for two decades, and in 2011 the Geo Group reported revenues exceeding $1.6 billion. Their largest sources of income are U.S. state and federal prisons, and detention centers for illegal immigrants: both of which have come under criticism for alleged violations of civil liberties and human rights. The CEO of Geo Group holds bachelor's and master's degrees from FAU. The terms of the agreement and the stadium's official name are still unknown, but FAU will receive about $5 million over the length of the deal.